My objects are rings. My nana gave me a ring, similar to the platinum one, when I was 16. It was stolen when I was 21. Years later, I found this ring and bought it as a replacement. The age and style of the ring reminds me of my nana. The wedding ring I wear with it belonged to my grandmother. 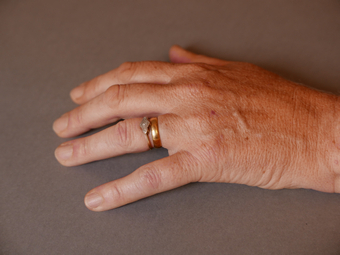 Its almost-square shape was the result of being caught in a sash window; the ring saved her finger. I like to think of the rings as representing physical safety, and emotional healing and rest. I like the contrasts in this painting. Like life-stories, there is darkness and light - structure in the darkness and softer, brighter structure in the shell, drawing the eye to the centre. This resonates with my rings and my life - brokenness and hope emerging from the darkness. I like the fragments in the painting; my grandmothers left me fragments of themselves.